The last day of the festival was nicely thought by the organisers. Only 3 bands on the main stage, with the last show ending at 9 PM so that everyone could get home in decent time and start the working week on Monday somewhat rested. 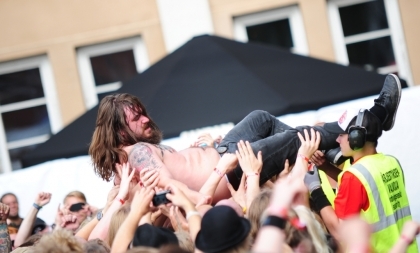 We went there early to watch the performance of the crazy Norwegians from Kvelertak. I just saw them live 2 weeks prior to Tuska, at Norway Rock festival, and they had such an amazing show that I had to convince everyone I could to go and see them. And I am pretty sure no one was disappointed. The 6 piece band from the West coast of Norway play a weird mix of punk/black metal as far as I noticed, but I wouldn't be surprised if people find other genres in their music. All based on Norwegian lyrics, inspired from Norwegian themes, but sounding so alive and so good that it doesn't really matter if the crowd doesn't understand a word. Especially when everyone on stage if continuously jumping around, throwing their guitars in the air, running, stage diving, crowd surfing, etc. It's breath taking and I am sorry I missed some of it due having to go for an interview. I am really recommending it to everyone to see this band live at least once. 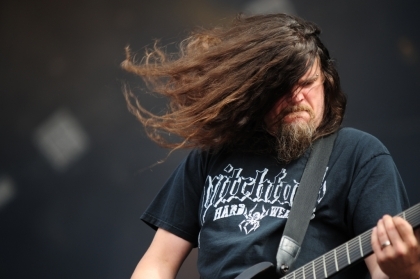 Afterwards, on the main stage it was time for another explosion of energy, backed up by an extreme technical metal from the Swedes from Meshuggah. Another band I already saw a couple of times this year, but whom I'd happily watch live again and again. The singer, Jens Kidman, is doing a great job at screaming/singing the lyrics of their unnaturally rhythmed songs and also at scoring some jokes in between them. But what's more fascinating each time is to keep an eye on either the guitarists or the bass player and the way they actually play. Or, especially the drummer, if you can even catch his moves and figure out how each limb can act so independently from the others. And in that kind of law defying music, it's always surprising how good the solos of Fredrik Thordendal fit. On the program it was announced they would play 75 minutes, but to my surprise it was only one hour. So it didn't help much running to the smallest stage, take photos for 3 songs of another band, then running out to try to catch the end of Meshuggah's show. On that stage I got to witness the intense bleak show of another Swedish band, this time Shining. A rather deep intense atmosphere created from the moment they all entered the stage and maintained for as long as I stayed there by the lead singer, Niklas Kvarforth who sand passionately their depressive dark/doom songs. He's a fantastic front man for their music. I doubt there's anything he wouldn't do on stage, at least from what I previously read and saw in photos. That day all I saw was him drinking whiskey, spitting it towards the crowd, lighting off a cigarette on his arm or slapping his bass player. I only saw three songs and I had such mixed feelings of curiosity, being horrified and admiration that he actually dares to do those things on stage. Back on the main stage for the melodic/doom/progressive/folk blend of the Finns from Amorphis. I have seen them live only once, many years ago, and it was really cool to watch them with their home crowd. They were loved and that added an extra sparkle to their show that tried to blend songs from the newly released album with older hits. My highlights were hearing 'My Kantele' sung together with the audience and 'Song of the Troubled one'. I am not very familiar with their new materials, so I spent my time looking at the crazy head banging of the singer and admiring his powerful voice, together with the nice keyboard solos. Their show was also spice with a lot of pyro effects, but they were a tad wasted due the bright daylight. On the smaller main stage it was time for another Finnish band, Turisas, which could as well just ended the day as far as I am concerned. In the same style as Kvelertak earlier did on the same stage, they totally rocked. They were 7 on stage, out of which 6 had their faces painted in red and black and wore fur or leather clothes and accessories to complete the viking party atmosphere. the only one lacking the face pain was the pretty accordion player, Netta Skog, who adds a certain charm to the roughness of her male colleagues. The poor guys were probably boiling and the paint must have been horrible in that heat, but that didn't stop them from getting everyone to dance, jump, clap or sing at all times on their fun folk rhythms. It's not often that you see a violin and accordion on stage at metal concerts, so, despite the craziness of the guitar or bass players, or the singer for that matter, these two were the highlights for me. It was an exhausting full of life performance. To stay in the realms of the Vikings, the main stage treated us with Amon Amarth. They do have intense songs, a strong vocalist - Johann Hegg - with a voice like thunder and nice melodies, but after Turisas I honestly was not much impressed, hence I won't say anything about the show. With the biggest regrets that this fantastic weekend ended, combined with the joy of hoping to catch up with my 'regular' sleeping, I left the Tuska area hoping that my first time there won't be the last and I will get to experience the friendliness of Finland and its metalheads more often in the future. And I recommend everyone to give it a try.